This time it's me, coming with a call for Your support in a dpoll which will decide who gets a delegation of 20K SP by @theycallmedan. There's a chance you didn't know about it yet, right? Yeah, it's about the poll and its creator. That's the topic of the week, I guess. But it's also about your place here. Our place here. with just a vote and sharing with your friends. 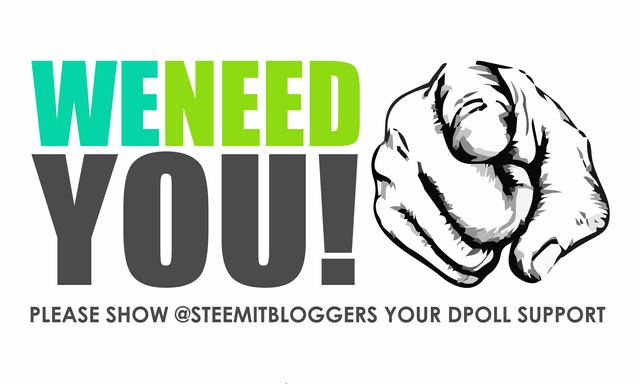 help @steemitbloggers help those who promote the platform through their creations and engagement. And this is how you stimulate those who take extra care about what they show and what is the thing that all people coming to take a look at the platform will see. As is everybody else, right. But this is in favor of everybody else, too. If you want to know how, post a comment about what you're doing. Remember, it's One New Stanza per Day. The current post NEEDS your pen!!! It's amazing how so many are coming out to write post to get support for the dpoll. It is indeed very inspiring to see this @ireenchew :) Such an amazing collective of passion! Very special people and we are all very blessed to be connected! Thanks for the link, Man. I await the launch of your Contest. We are the Power House Creatives ... we Create!!! We are small in number relative to our competitors, but what distinguishes us, beyond our creative talents, is our willingness to "fight for it." No one can possibly have missed the message ... and it is one that resonates deeply in the Hearts of Men. The world, or the blockchain, is not changed by "the reasonable." It is changed by those you refuse to yield. We're everywhere!! So much talent, and also so many members supporting truly great projects on the blockchain. Looking forward to seeing what contest you bring to the table! #powerhousecreatives for the win! dont be sorry :) Just thought I would clarify :) and thank you for the support :) we REALLY appreciate it!